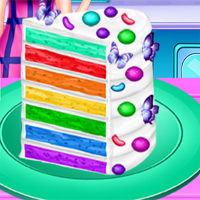 In Vincy Cooking Rainbow Birthday Cake, Vincy wants to bake a colorful cake for her birthday. The party is tomorrow, so let's get started and prepare the cake batter. Put the ingredients in the bowl and mix them together in the right order. Split the cake batter into different bowls and pick a brightly colored food dye for each layer. Stack up the different layers neatly and coat everything with a thick layer of sweet icing. When you cut the cake, the rainbow will appear!